In 12-inch skillet, cook beef over medium-high heat 5 to 7 minutes, stirring occasionally, until thoroughly cooked; drain. Stir in hot water, sauce mix (from Hamburger Helper box) and beans. Heat to boiling, stirring occasionally. Stir in uncooked rice (from Hamburger Helper box). Reduce heat; cover and simmer about 25 minutes, stirring occasionally, until rice is tender (sauce will thicken as it stands). Meanwhile, in small bowl, stir milk and topping mix (from Hamburger Helper box) 30 seconds; set aside. Remove beef mixture from heat. 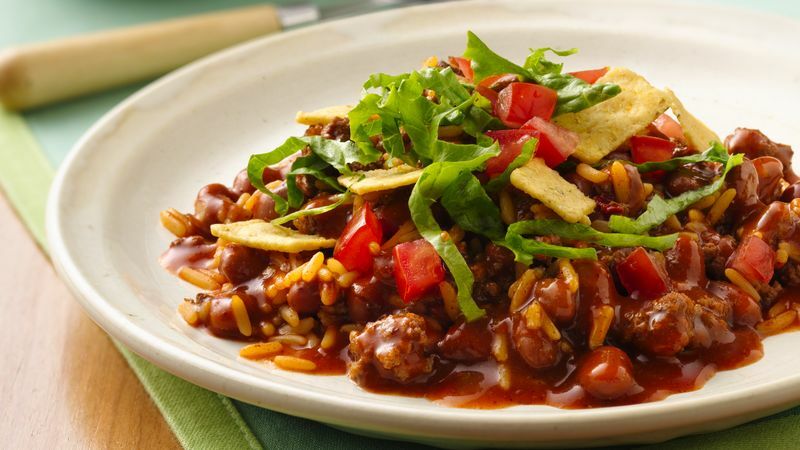 Top each serving with cheese topping, lettuce, tomato and corn chips (from Hamburger Helper box). A dollop of sour cream or guacamole will really top off this dish!